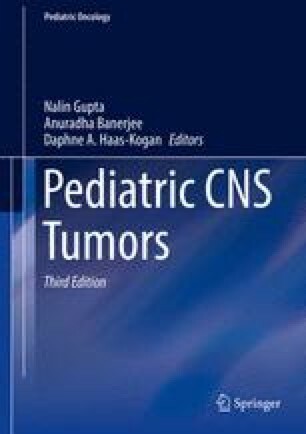 Ependymomas comprise approximately 10 % of all pediatric central nervous system (CNS) tumors and are the third most common brain tumor in children less than 20 years of age (Gurney et al. 1999). Ependymomas are gliomas that originate from the lineage of cells that give rise to the differentiated ependymal cell layer lining the ventricular system and central canal of the spinal cord. The majority of those arising in the brain, up to two-thirds, arise in the posterior fossa. The percentage of ependymomas arising from the posterior fossa is greatest in children less than 3 years old (Horn et al. 1999). Data from the SEER group (Surveillance, Epidemiology, and End Results) suggest that the annual incidence of ependymoma is 2.6 per million for the 0–14 age group and 2.2 per million for the 0–20 age group (Linet et al. 1999; Ries et al. 1999). Another recent SEER data review from 2012 identified that ependymomas make up about 20 % of spinal cord tumors in patients less than 20 years old. This study also revealed that spinal cord ependymoma diagnoses as a whole have increased over time since 1990, likely due to increased histological precision (Hayden Gephart et al. 2012).